India has the highest Diaspora living in the world countries. A recent report from United Nations on the migrant population has revealed the drastic increase of population to 244 million in 2015, a record 41 percent increase juxtapose to 2000. The survey conducted by the United Nations, Department of Economic and Social Affairs. Among 244 million global migrant populations, Indians top with 16 million, Mexico 12 Million and Russia and other countries follow India. This growing trend in migration is part of all the countries, two third populations of the global migrants absorbed by the European and Asian countries. It is the astonishing fact that the progressive community from the Indian state Gujarat have settled in 120 countries out of 192 recognized United Nations countries. Indians have excelled in almost all the fields, Indians have been contributing largely to the progress of the countries where ever they live. Australian Government has recently honored three Indian-origin eminent personalities with the highest civilian of Australia. 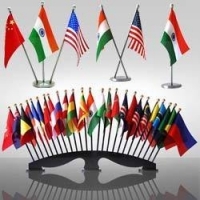 The progress and achievements of Indians abroad, today, has created a positive impression on the foreign countries to welcome number of Indians. US, Canada and Australia are luring the highly skilled professionals to meet their developmental goals. European Countries have introduced a standard entry scheme called Blue Card to attract the skilled professionals from South Asian countries who are in high demand.